Ireland’s Mysterious Ancient Poulnabrone Dolmen in the rugged Burren region of County Clare. 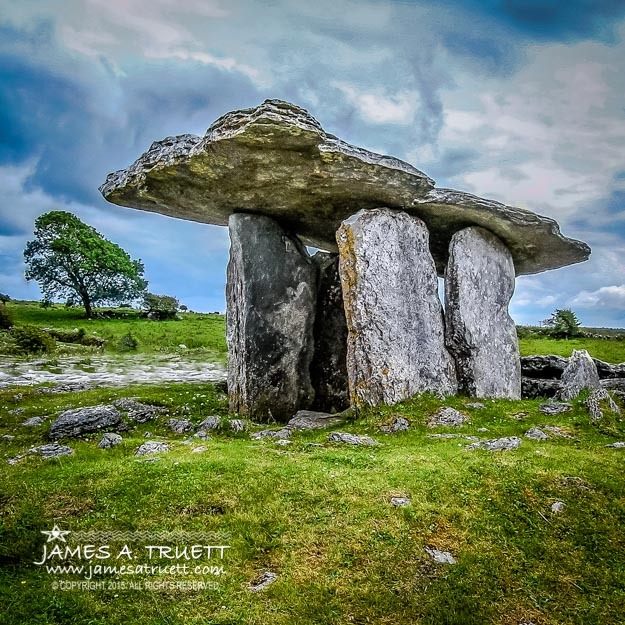 It’s really amazing to realize Ireland’s ancient Poulnabrone Dolmen, or “Hole of Sorrows,” another popular tourist destination, was built around the same time as the pyramids of Egypt! In the barren Burren region of County Clare, this portal tomb is believed to have been built between 4200 and 2900 B.C. Excavations during some repairs in 1985 uncovered the remains of 16 to 22 adults and six children, plus personal items such as quartz crystals, weapons and pottery. As the area around Poulnabrone is sparsely populated with minimal nighttime illumination, the tourist carpark doubles as a popular gathering place for stargazers and astronomers.